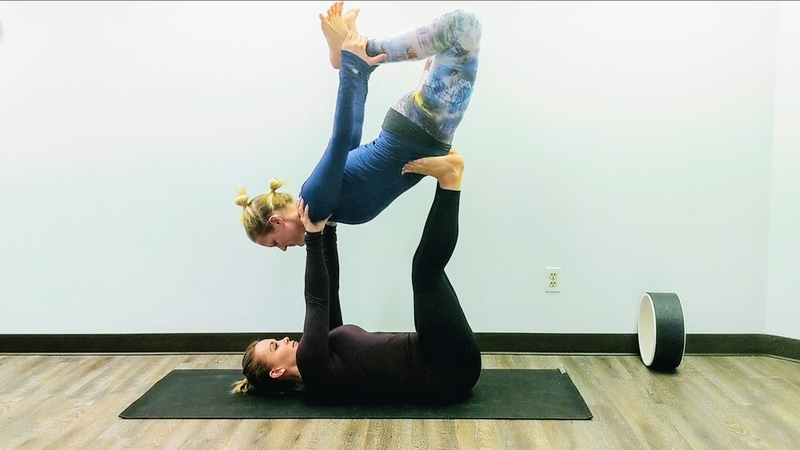 The warrior package is a hybrid of yoga and strength training offered as a collaborative effort with Kristin Johnson and Lotus Jo’s Yoga Studio. We noticed that there was a disconnect between the different categories of fitness and that while strength training and yoga are both remarkable for the body and mind, they work better together. Putting our heads together to find a way to offer yoga and personal strength training at rates that made sense we created the warrior package. There are 4 different options, 2 individual packages and 2 partner packages. In creating these options we strongly believe we can better serve our clients that are looking for the whole package in an environment that is nonjudgemental, that meets your where you are, and creates a strong community to support you on your journey—whatever that looks like for you. During this 6-week series you will schedule 6 1:1 training sessions with Kristin to work on strength training. We recommend working out with Kristin once per week over these six weeks. You also receive 12 yoga sessions at Lotus Jo’s Yoga Studio. These yoga classes can be taken at anytime we offer classes, see our schedule. We recommend that you aim for 2 yoga classes per week during your 6-week series. We can work with you to recommend the best classes based on your goals and depending on your schedule and the type of yoga class you could even have your training and yoga back-to-back. *$300 value, all packages start with the first training session scheduled (must be used within 6 weeks of start) and expire 6-months after purchase. During this 6-week series you will schedule 12 1:1 training sessions with Kristin to work on strength training. We recommend working out with Kristin twice per week over these six weeks. You also receive 12 yoga sessions at Lotus Jo’s Yoga Studio. These yoga classes can be taken at anytime we offer classes, see our schedule. We recommend that you aim for 2 yoga classes per week during your 6-week series. We can work with you to recommend the best classes based on your goals and depending on your schedule and the type of yoga class you could even have your training and yoga back-to-back. *$480 value, all packages start with the first training session scheduled (must be used within 6 weeks of start) and expire 6-months after purchase. During this 6-week series you will schedule 6 training sessions together with your partner and Kristin to work on strength training. We recommend working out with Kristin once per week over these six weeks. You also receive 12 yoga each sessions at Lotus Jo’s Yoga Studio. These yoga classes can be taken at anytime we offer classes, see our schedule. We recommend that you aim for 2 yoga classes per week during your 6-week series. We can work with you to recommend the best classes based on your goals and depending on your schedule and the type of yoga class you could even have your training and yoga back-to-back. *$600 value, all packages start with the first training session scheduled (must be used within 6 weeks of start) and expire 6-months after purchase. Partner packages must use training sessions at the same time. If one person misses the session, the session is forfeited for that partner. During this 6-week series you will schedule 12 training sessions together with your partner and Kristin to work on strength training. We recommend working out with Kristin twice per week over these six weeks. You also receive 12 yoga each sessions at Lotus Jo’s Yoga Studio. These yoga classes can be taken at anytime we offer classes, see our schedule. We recommend that you aim for 2 yoga classes per week during your 6-week series. We can work with you to recommend the best classes based on your goals and depending on your schedule and the type of yoga class you could even have your training and yoga back-to-back. *$960 value, all packages start with the first training session scheduled (must be used within 6 weeks of start) and expire 6-months after purchase. Partner packages must use training sessions at the same time. If one person misses the session, the session is forfeited for that partner.